Heat printing is a really easy decorating technique you can use on all of our products. Essentially, heat printing is the process of applying a heat transfer vinyl or substrate that has an adhesive on the back and is applied to a product by using specific heat and pressure from a heat press. We teamed up with Stahls, the leading manufacturer in the category, to learn how to heat press and get the best results on some of our top fabrications. Because we, at BELLA+CANVAS, offer such a wide variety of fabrications, it’s important to understand how each fabric takes heat printing differently. Three key factors to keep in mind are: time, temperature and pressure. Cotton is the most common printable fabric in the apparel industry. Because it’s so resilient, you can use a variety of times and temperatures. BELLA+CANVAS uses only 100% Airlume combed and ring-spun cotton, which has significantly less stray fibers and impurities than any other cotton product on the market. That mean, the tight weave and smooth surface is the best to print on. Stahls recommends pairing our 100% cotton tees with their CAD-CUT® Fashion Film® HTV. This HTV is known for its light-weight, soft, matte finish and is Stahls’ most price-point product, which pairs great with our most price-point garments. For all products that include synthetic material, you’ll want to keep the time and temperatures lower to avoid scorching the products. You’ll also want to be weary of high-heat transfer applications. 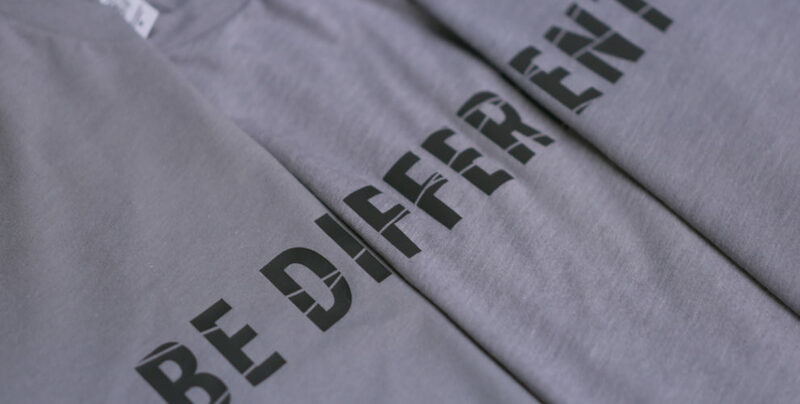 Our Heather CVC tees are made up of 52% Airlume combed and ring-spun cotton and 48% polyester. These have the comfort of the cotton and durability of the polyester. 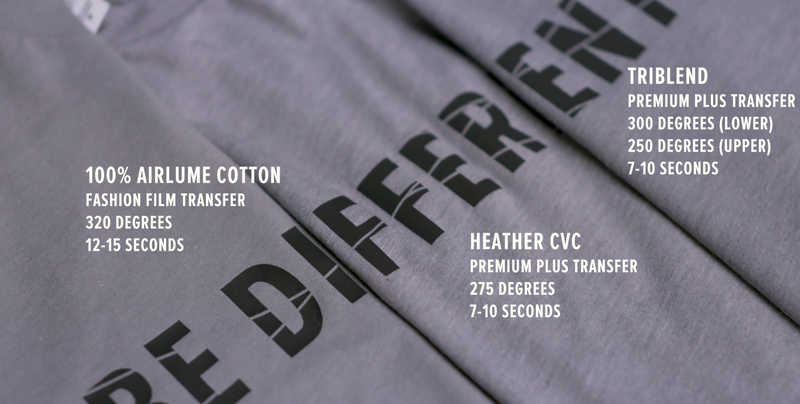 Since our Heather CVCs are a step up from our 100% Airlume cotton tees, you’ll want to pair them with a more premium application. Stahls has a great option, which is called CAD-CUT® Premium Plus™. Premium Plus™ is very light-weight, is applied at a low temperature and allows the natural stretch of the product. Our triblends are known for their softness. They are made up of 50% polyester, which gives durability, 25% Airlume combed and ring-spun cotton, which gives off the comfort and 25% rayon, which adds that extra soft hand. In general, triblends can be difficult to print on because of the rayon, which is a substitute for silk and can scorch under high heat. Stahls recommends for the best results to use a low temperature material and a heated lower heat press platen. The lower heat press platen adds a heated element to the underside of the garment, which cures the adhesive from the underside of the garment. The top heated element, which will be lower in temperature, will finish the application by applying recommended pressure and time under the heat press. This will ensure that there is will be no scorch marks or heat press boxes on the finished side of the garment. See all these steps in action and the final results in our video below!